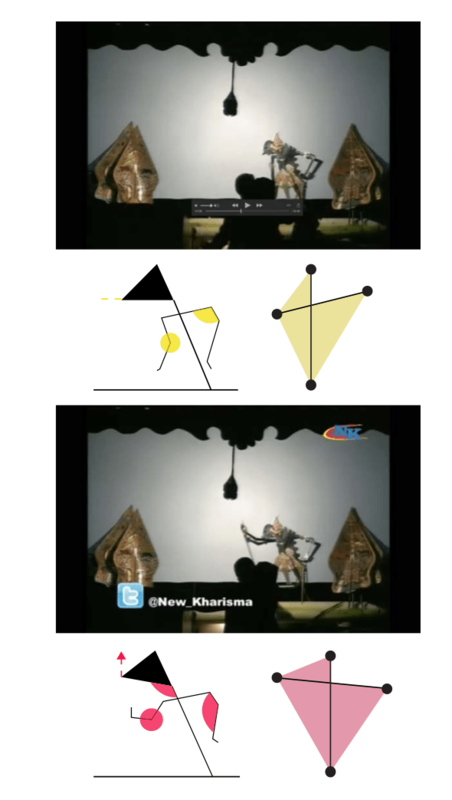 Wayang Kulit or Indonesian traditional shadow puppetry is an ancient form of narrative that utilises light and shadow. This performance shows the projection of flat leather shadow puppet on white screen from behind. Then the master puppeteer called Dhalang manipulates the puppets’ arms in order to illustrate the characters’ state. Groenendael (1985) stated an interesting fact through her work that Wayang Kulit performance only consisted of eight basic gestures. It then becomes a paradox since ones know that Wayang Kulit performance lasts for five to six hours. This fact might raise a question, how the narrative can be built with the limited amount of gesture? What are the aspects from the shadow puppets that are significant as the utterance? 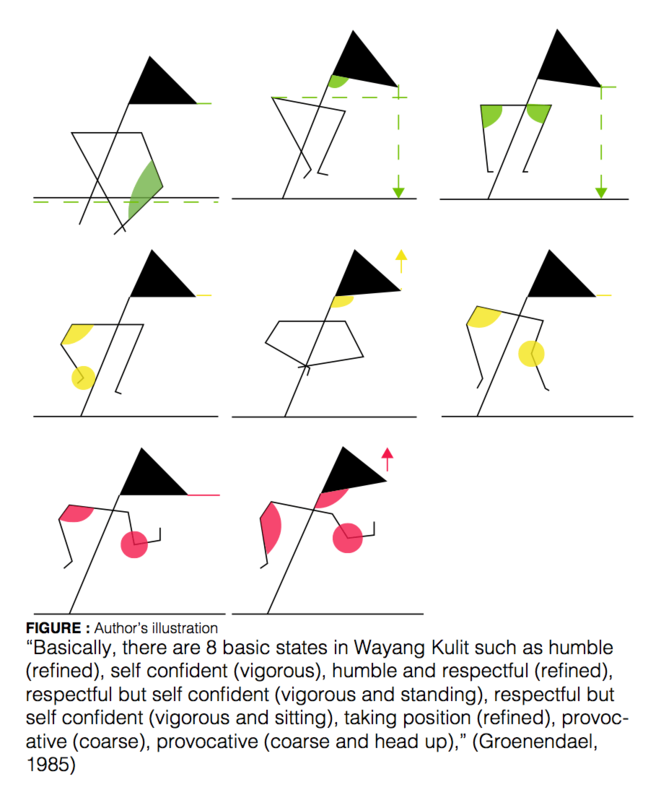 This writing tries to seek the possible aspects from the shadow puppets that are significant as the utterance through observing the Wayang Kulit performance and a narrative animation of Heider and Simmel’s work (1944). According to Groenendael (1985), there are only eight basic gestures of the shadow puppets’ state. The image below illustrates those basic gestures. By having the vocabulary of gestures, preliminary observation was made by seeing a part of Wayang Kulit Performance that lasted around six minutes. The observation was trying to compare the states illustrated before with the narration. The example taken is the scene where the antagonist became so angry with his enemy. The character created a big angle between the two arms and made open-close movements rapidly. Emotion that is articulated, is concluded as arouse emotion by Dolan (2014). At this point, it might be possible that angle and movement intensity play a role as utterance. Another example that one can have a look is the experiment made by Heider and Simmel (1944). This is a series of animation that the characters are represented by geometry shape such as circle and triangle. As an example, a scene that illustrates an arouse emotion like being furious is captured. 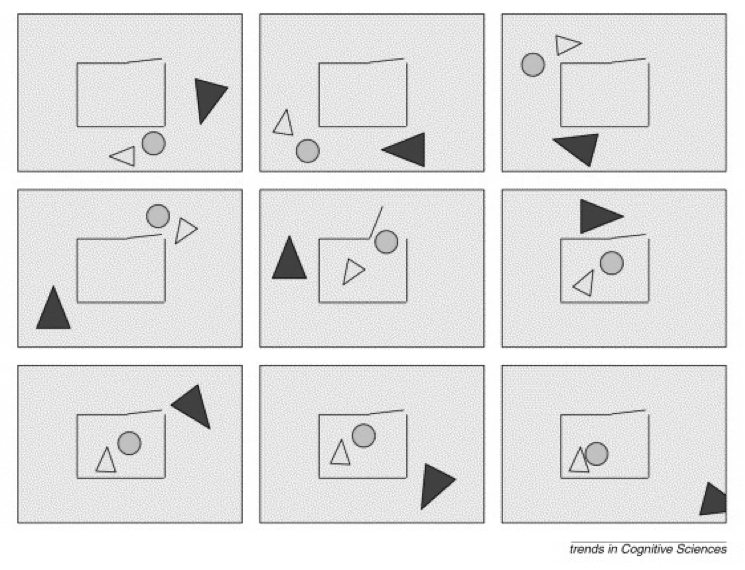 When the big triangle is chasing the smaller triangle and the circle, all the shapes move together intensely. The big triangle also turns quickly and created around 180-degree angle at the beginning. This observation may also suggest that angle and movement are able to signify particular meaning or emotion. This is interesting to see how a figure which seems different from the real figure can still be perceived as it is. Future investigation can be developed in order to complete the research.